Collaboration key to successful Human Trafficking Awareness campaign in Košice, eastern Slovakia. 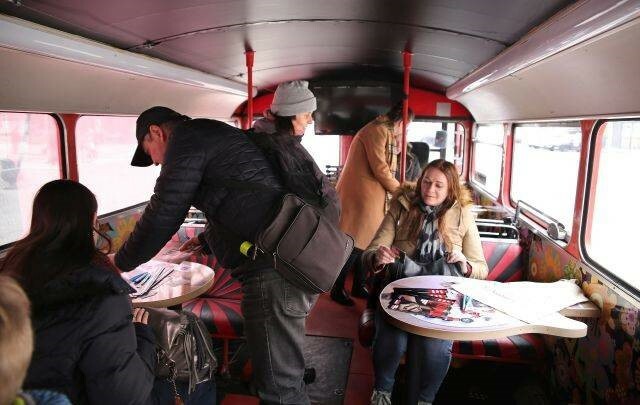 RENATE members at CARITAS Slovakia share news with us about the success of the Red Bus Human Trafficking Awareness-Raising Campaign held in Košice, the second largest city in eastern Slovakia. The event was organized by the British Embassy in Slovakia, together with the Ministry of Interior, the National Crime Agency, the GangMasters and Labor Abuse Authority, Caritas Slovakia and the City of Košice. 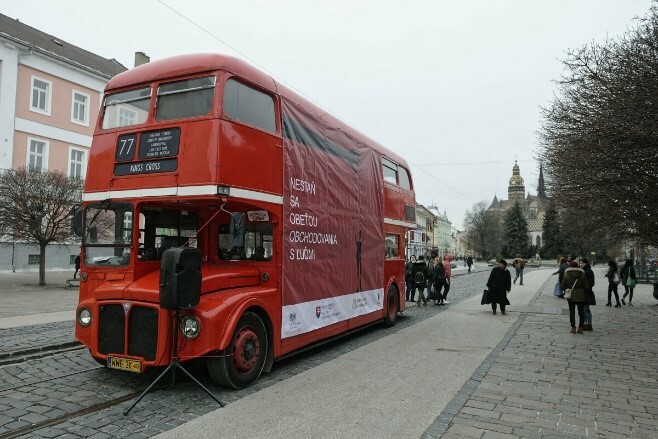 A typical ‘’London’’ double-decker bus was parked on Košice’s Main Street, where locals and visitors had a chance to see it on Wednesday, March 13, 2019, as part of an awareness-raising campaign on human trafficking. The UK Embassy in the Slovak Republic supports educational activities in this area, as the UK is a top country of destination for Slovak victims of trafficking. “We came to the east of Slovakia because the victims often come from this region, especially from Roma communities, who are more vulnerable to this phenomenon. The main goal is to raise awareness so that people do not become victims of human traffickers, ”said Kimberly Gillingham of the British Embassy. The program consisted of three separate sections for different audiences. It started with a press conference for media representatives, where Kimberly Gillingham (British Embassy), Jozef Halcin (Head of Crime Prevention Department) and Jana Verdura (Caritas Slovakia, STOP Human Trafficking project) responded to journalists. Right after the press conference, a workshop on human trafficking took place for invited experts from the city police, non-profit organizations and social workers. In addition to representatives from the Crime Prevention Department and the Slovak Catholic Charity, a presentation from the Gangmasters and Labor Abuse Authority was presented. This British agency is investigating modern labour and exploitation in the labour market. At the same time interactive activities for high school students took place directly on the bus. On the ground floor, short films about this phenomenon were shown to young people, and discussed with colleagues from the Crime Prevention Department of Ministry of Interior and British border police officer. The second half of the students were involved in interactive sessions on the second floor with the workers of Caritas Slovakia. Then the groups exchanged. Brochures and leaflets were available for students and their teachers to remind them of what they need to know before they decide to travel abroad. After the school sessions, the bus was also open to the public. It has been a most successful campaign, with opportunities to inform and heighten awareness amongst people of all ages on the day.